Meaner than a Junkyard Dog? Meaner than a junkyard dog? I grew up working in my dad's junkyard and I can tell you that I just don't believe it's possible to be meaner than a junkyard dog. As anyone who has spent time in a junkyard knows, a lot of the folks that come looking for parts, well, let's just say they ain't Boy Scouts. The dogs are there to keep those people in line, and to make sure that everything that was in the yard at closing time is still in the yard in the next day. Junkyards are interesting places with some unique vehicles. 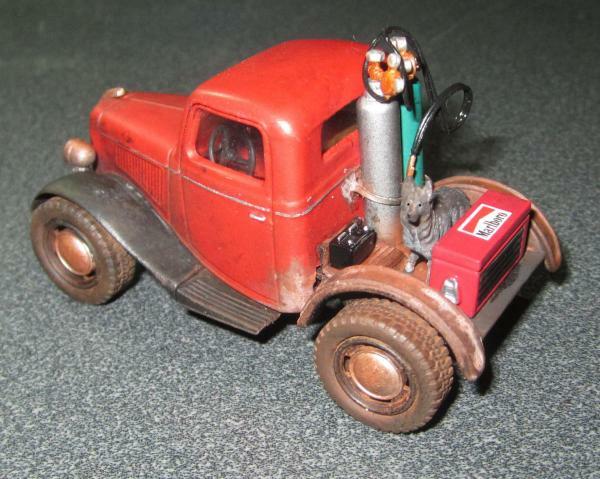 This shortened Ford was inspired by a truck we used in our yard. Ours was built from a Willys, but this one is pretty true to form. The dog in the back is a tribute to a 140lb. King Shepard named Rock who died defending our property late one night. He took down three men, none of whom got away, one of whom lost a leg. 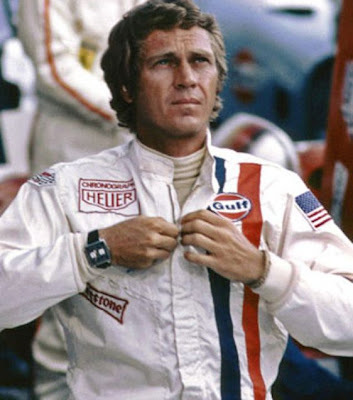 Not so much as a bolt was stolen under his watch. 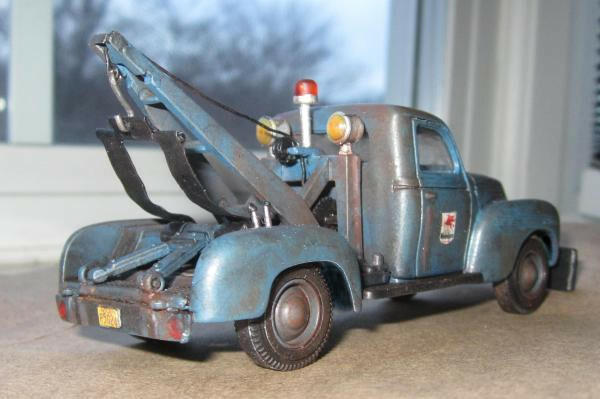 On a lighter note; Tow trucks are cool. Call'em tow trucks, call'em wreckers...hooks...whatever. They are cool. Like tugboats, they have only one purpose. Tow'em or tear'em in half. This glimmering little jewel also started out as a Solido fire truck/recovery vehicle. I added the push board up front because that is what we had on our wrecker. The excuse was that it would be handy in the yard, The reality was that it was there so we could use it as a "push truck" and get into the dirt track races for free. 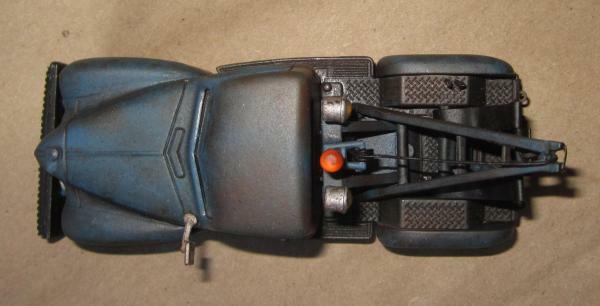 The No-Mar rig, boom controls, and rear end are scratch-built. Most of the work involved removing the "filler" from the boom. Speaking of dirt tracks...This truck is an example of another single-purpose vehicle; The water truck. These were used to keep the tracks wet enough to provide good traction and keep down the dust. The donor truck was a Solido tanker, I added the watering system and the graphics. Last edited by Alex_W on Tue Apr 09, 2019 6:26 pm, edited 1 time in total. Re: Meaner than a Junkyard Dog? These are different, and interesting with a great story behind them. Great work, love them all. The Junkyard I frequented in my younger days had an old Ford wagon as a mobile tool truck. They had everything from hand tools to torches on it. They also had an old Jeep tow truck. I really enjoyed seeing yours and hearing your stories! I used to watch the speedway religiously as kid and it was my first introduction to Motorsport. 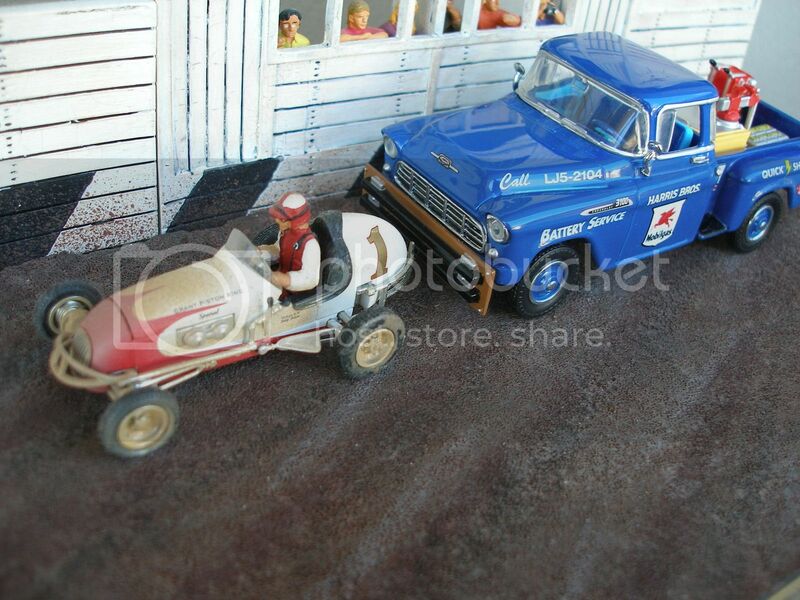 The push truck and the water tanker both appeal to me and would look great with a couple of the GMP speedway cars in a diorama. Some great sprint car drivers come from your neck of the woods. I saw Kerry Madsen go at it hammer and tongs with Chad Layton on the first night of the Williams Grove National Open (2007 I think). They traded the lead two or three times a lap until Layton got away on a restart. I was raised in the heart of "Pennsylvania Posse" country where dirt track racing is like a religion. If you ever get a chance to visit there you should try to catch a race at "The Grove". It's reputation among sprint car fans is well deserved. What a great diorama. That is a skill I have not yet mastered, although I'm going to try my hand one day. 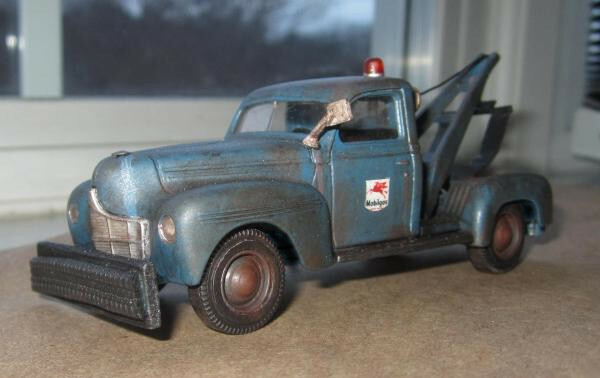 Is the push truck one of the series from Matchbox? Those are great looking trucks. And midget racers from that era are wild. Basically a seat and an engine. Those guys were crazy. I just noticed the old telephone exchange is LJ5 (555). This exchange is used in every movie and TV show in the US because any 555 prefix automatically connect to the telephone company. I guess Matchbox didn't want to get complaints from someone who had the number. Anyone in any area code who were unfortunate enough to have the number "867-5309" had to have it changed because people would call day and night asking for "Jenny". I have been to The Grove in addition to a few other PA Dirt Tracks but mostly Sharon Speedway. But I am a pavement guy through and through. 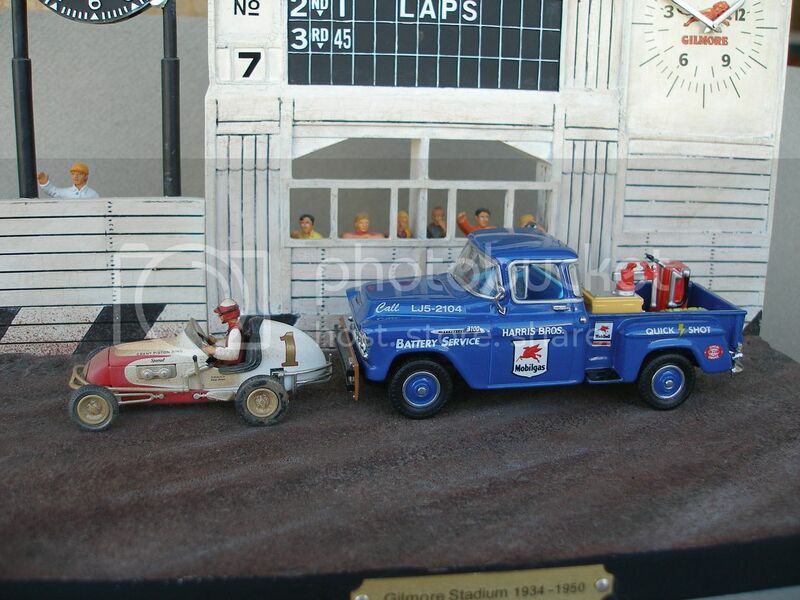 I would like to take credit for the Diorama but I cannot, it came that way (Minus the truck) from GMP. Your reply caused me to realize something. Correct me if I'm wrong, but as far as I know there are only three "THE" venues that pretty much all racing fans recognize without naming them; The Speedway, The 'ring, The Grove. Oddly, "The 'ring" isn't a ring, and there is nothing peaceful about "The Grove". The Speedway on the other hand has pretty much defined the word used to describe it. I've never been to Sharon, but I know of it. They have a lot of great late model races there as I recall. I think you would have to include Eldora on that list. And I am all for including the 'horne (Langhorne) from days gone by. When I was going to Sharon Dave Blaney and Kenny Jacobs were driving and dominating in 410 Sprints while Lou Blaney was doing the same in Modifieds. 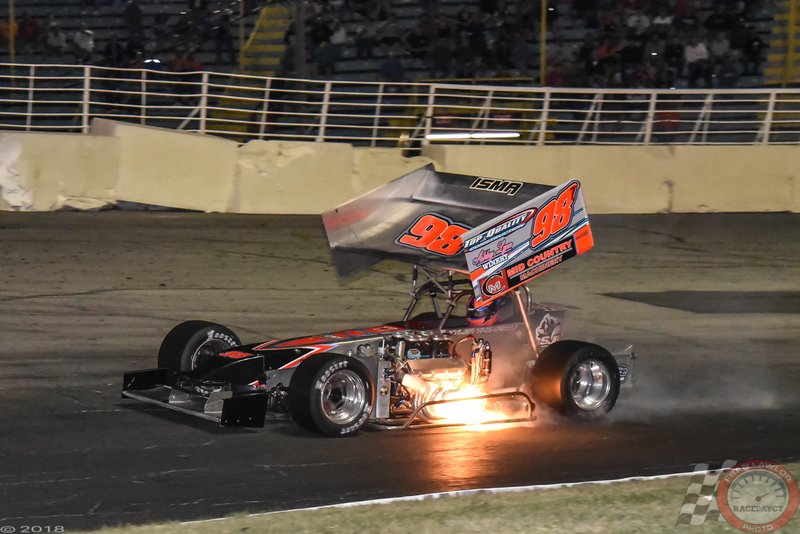 410 Sprint Cars are another of those things that, like funny cars, must be experienced first hand. Sprint car drivers are bat $#!& crazy. I feel the same way about pavement Supermodifieds.